It was another beautiful day at the farm and Doggy was out to play. But he was having too much fun and fell into Old Man Johnson`s truck, headed to the market. By the time Doggy jumped out it was too late. He was lost, a long way from home. Now you have to guide him back. Trace a matching path to clear the way. If you trace an extra long path, you get an extra bonus! Help Doggy meet new friends along the way. The farm is calling him back, but it`s up to you to show him the way! Finding Doggy is rated 3.5 out of 5 by 12. 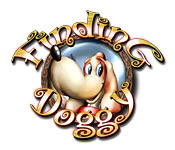 Rated 5 out of 5 by JulzCat from Finding Doggy Is A Blast! I was surprised at the bad reviews. I've played this game several times over the past decade and still love it! You have to help doggy find his way back to grandma. They have a story mode and an endless mode. I only played in story mode and you can do it timed or untimed. It's not the traditional match-3 game. You have to build chains to help doggy find his way to the door. They have items you can earn to help out plus lots of bombs and items to get you where you need to go. You can also earn lovely trophies for achievements. Rated 5 out of 5 by mrm2006 from Oh Where Has My Little Dog Gone? I like Match 3 games (M3) but I generally dislike the games that are not "swap" but "make a trail" of 3 or more. I was genuinely surprised at how much I loved this one. Could it be because I just got my own little doggy puppy last week? Awwww - I have a soft spot in my heart. Storyline: Old Man Johnson took his truck out every day and passed the Old Woman's house each time. On this particular day, however, Old Man Johnson stopped at the Old Woman's Gate and the 2 began a long conversation. The Old Woman's Little Doggy saw a magpie and they started to play. As the magpie flew and soared away in the sky, Little Doggy followed. Then, BOOM, Little Doggy fell off the the top of the house (?) and into Old Man Johnson's truck - knocked unconscious. Then, Old Man Johnson drove off away from the Old Woman's house. Magpie was so upset she tried and tried to wake Little Doggy up. He was her friend and she didn't leave him alone but flew along cawing and cawing until she dropped into the truck with Little Doggy from exhaustion. The truck went CRASH, hitting a big bump in the road and Little Doggy flew out (with the box he was in) of the truck and into the middle of the road. He looked around and around and knew only one thing - he was far, far away from home. Now, you have to help Little Doggy find his way home so he and the Old Woman can be happy again, because she is very upset and calling and calling for him. Graphics: For the type of game this is the graphics are extremely well done. Even the cartoon images showing us the storyline are done extremely well - not leaving out any detail whatsoever. It was a sheer pleasure to read along. Sound: I LOVED the background music. It is extremely relaxing and has a nice lilt to it. Very enjoyable to listen to. Game Play: You have to find the secret path hidden beneath the game pieces on the board by tracing a path of 3 or more like items. You can earn many power ups and "friends" along the way with special powers to help Little Doggy find his way home. The path leads from Little Doggy to a doorway. Once you find the hidden path to the doorway, the level is completed. This Glam-ma did not expect to even like this game. However, much to my surprise, I absolutely LOVED it. I felt such a sense of relief and accomplishment every time I helped Little Doggy find the door along the hidden path. It could be because I just rescued a little 6 week old puppy (Freya) or I just am a natural born softie. In either case, this Glam-ma HIGHLY recommends you try this little gem of a game. It's free - it's an hour - and it's sure to tug at your little bitty heartstrings - lol. DEFINITELY a buy for this Glam-ma - hope it is for you as well. The review of this game is based on this Glam-ma's opinion - and only mine. Therefore, if you found this review to be helpful, please click on the "yes" button below. There is also a "no" button. Seriously? You'd give your Glam-ma a "no"? Kidding. Happy Gaming! Rated 5 out of 5 by trixie7533 from My game of the year for 2008 It is an adventure Match3 with lots of fun. A bit short though. Rated 4 out of 5 by melissa845 from Give it a try if you like Match Three This game might appear cartoonist but I think one likes Match Three Games,one could at least give it a try. The game gets harder as you go along but one also gets power-ups that help. Don't let the cartoon or the story line fool you. It is a fun game. Rated 4 out of 5 by fredandethel from Still not quite sure how this works Enjoyed the hour trial but didn't buy the game for a while. I'm now up to level 5 - 6 and seem to spend a lot of time seeing explosive tiles at the edges of the screen and not being able to use them. I get Doggy home in the end by mindless persistence, and the game is so colourful and different from anything else I have that it passes the time pleasantly. Perhaps I'll discover better techniques eventually. Rated 4 out of 5 by Squidipuss from Enjoyable Match 3 Variation I needed a game that was totally mindless, but not as repetitious as the usual match 3 game. Finding Doggy fit the bill perfectly. As you progress through the game, the bonus tiles are explained one at a time, making it easy to remember which is which. My only dissatisfaction with the game is that it doesn't work with a touch screen, but I don't expect older games to always work with one. Note: I didn't rate the sound quality because I turn off the sound on all games so that I don't bother my husband. 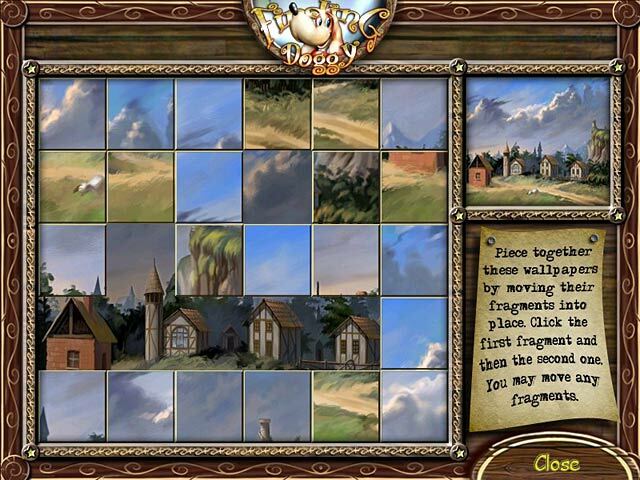 Rated 4 out of 5 by myyorkies1994 from A Fun Match 3 to Relax With... If you've played the '4 Elements' games you'll have the concept down for this fun match 3. The description is perfect on the download page, so don't waste a moment reading the three screens of verbose dialogue between the farmers...get right to the game. The first two levels are fairly simple. After that obstacles, power-ups and bonuses are introduced as you move forward. Not only can you make matches vertical and horizontal, but after the first two levels, you NEED to make matches in L shapes, as well. It takes a bit of strategy to clear the pathway for Doggie to reach the door, so it does present some challenge, too. I usually turn the music off after hearing it for a few minutes, but didn't on this game, as it was pleasant. I later found myself humming the tune while making dinner! The graphics are vividly bright and colorful. 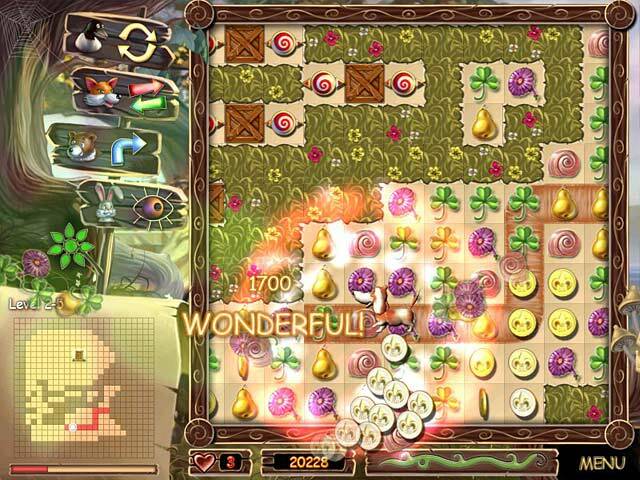 There are puzzles to assemble between levels that just add another fun element. It's true that the main game only has 50 levels, but it also has an endless mode so you can continue to enjoy game play. You can play this both timed or relaxed, but the timer is very generous. 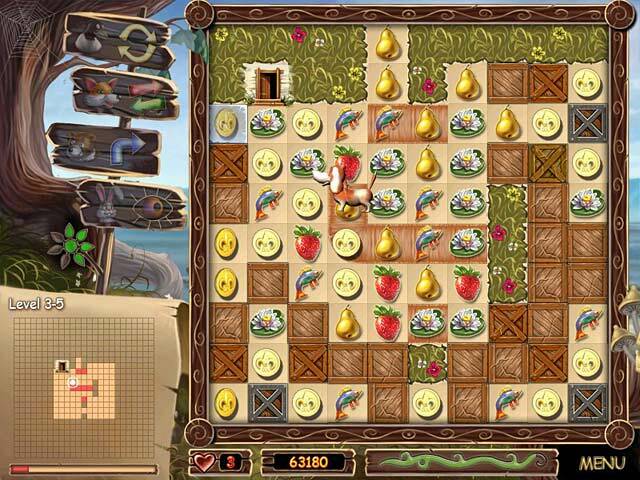 Not all games have to be as difficult as 'Heroes of Hellas 3' to be enjoyable. This game is just good fun! Enjoy! Rated 3 out of 5 by mommato1 from EVEN THE ENDLESS IS TIMED If you like to play for relaxation then don't buy this game. As the endless is still timed so there's not a relaxation mode. The game is ok, just sorry I bought it due to the fact that it said it had an endless mode which I could use for relaxing however the endless mode is still timed. Rated 3 out of 5 by Hillbilly_Gal from I've Played Better, I've Played Worse I played the entire one hour trial and after doing so, I can't decide if I like this game or not, which is the reason for giving this game only 3 stars. In a way this game is rather boring and monotonous yet in a way it's kind of enjoyable. My 6 year old granddaughter said, "Grandma, Finding Doggie is stupid, it gives me a headache." She's right, this game is rather stupid but I prefer to be not quite that harsh. She can play Farmscapes for hours, however. This is NOT Farmscapes or even similar to it. The objective is to match identical items of 3 or more so the doggie can follow the path to the door. I don't play any computer game with the sound on because the sounds from all computer games makes my daily headache worse. I recommend that you try this game for an hour then decide for yourself whether you like it or not or be undecided like me. "I do and I don't." Rated 2 out of 5 by Rika076 from Boring Chain M3 I love chain M3 games, so even though this was quite old, I thought I'd give it a try. Basically, Doggy gets lost and you're directing him down a pathway home. That's the extent of the storyline, and 50 levels of super easy chain M3 followed. The game offers so many bonuses that it's almost impossible to make a chain that doesn't explode at the end. This made their attempts at strategy annoying rather than fun. I was hoping it'd get more interesting but gave up after 20 levels repetition. Create matches to help Doggy find his way back to the farm, the only home he knows and loves.